Chess pieces and chessboard, presented by His Excellency Bertie Ahern, Prime Minister of Ireland, on March 17, 1998 at the St. Patrick’s Day event at the White House. 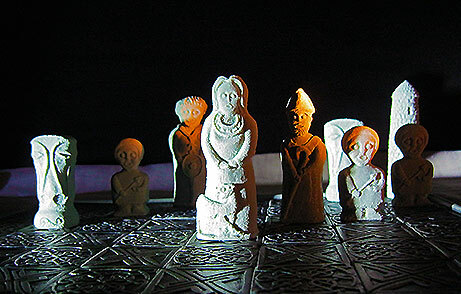 Killyliss Studio chess set inspired by Irish art of the first through eighth centuries A.D., particularly the White Island figures of County Fermanagh and the high cross of Moone, County Kildare. Designed and sculpted by studio artist Colm McCann, hand-cast in crushed Glens of Antrim limestone. “Chess Set,” Clinton Digital Library, accessed April 25, 2019, https://clinton.presidentiallibraries.us/items/show/57493.